Snoring is a very common disorder among people with an evaluated prevalence of 2% in women and 4% in men. Obstructive sleep apnea is described as a condition with intermittent obstruction of the upper airway during the sleeping period. When this situation is presented, people often face repeated apnea episodes with complete cessation of the airflow, sometimes hypopnea which is manifested by partial reduction of the airflow, and at some situations sleep fragmentation, and also oxygen desaturation. When these things are occurring in patients, their brain may receive signals from their body that the oxygen levels are too low for functioning healthily. Worldwide is agreed that continuous positive airway pressure (CPAP) represents an effective therapy solution for OSA. According to many studies, more than 50% of patients are noncompliant after the first year. Oral appliance therapy may be indicated in these cases. This type of therapy is often known as a mandibular repositioning device or (MRD). It is effective therapy alternative which can be taken into consideration as a first-side solution for those patients who are facing mild and moderate sleep apnea. 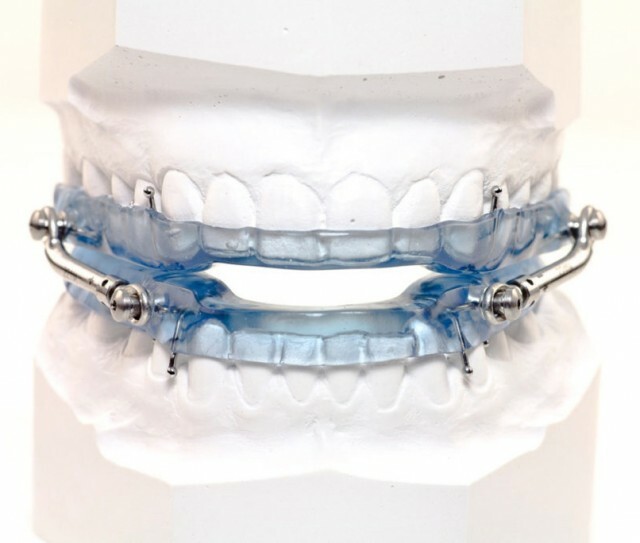 This dental appliance is custom-made and it is an easily adjustable device. The great thing is that it holds the lower jaw in a forward situation during the sleeping time. The expanded area behind the tongue caused by this device, in order to reduce the collapse of the airway, puts tension on the pharyngeal walls and it also diminishes the vibrations of the soft palate. Oral appliances are highly recommended by the American Academy of Sleep Medicine. There are numerous factors that can determine which solution is the best match for a specific candidate. For example, if the patient already uses the CPAP therapy successfully, then there is no need to change the winning combination. But, in cases where patients can’t get used to it, they may find their right option at a dentist office but only when the dentist has more knowledge and he gained the specialty training in dental sleep. Oral Device Therapy is very different from CPAP and it provides better comfort for the indicated patients. For many patients who tried and failed CPAP treatment therapy and also for patients who suffer from mild to moderate sleep apnea, oral device treatment option is an excellent solution. Oral device therapy is a sophisticated way of enjoying life and experienced it through another and better perspective. Another great advantage over the conservative CPAP therapy is that these appliances could be stored in a small travel case and easily carried in a briefcase. They don’t require electricity to normal function. All patients who ever tried these devices claim that they are very comfortable and they don’t make noise so, your partner may sleep next to you without a problem. The last big advantage over the traditional CPAP therapy is the while patients wear the oral devices they can talk, drink, and open their mouth. However, the best device would be the one that will meet the patient’s expectations and the one that would be used the most. Interested in an anti-snoring device?